Somewhere, Blizzard must be laughing. For all that their Diablo games have generated numerous discussions about whether they should be considered role-playing games at all, Diablo and Diablo II started the action role-playing game genre, and they are still the undisputed kings. Every so often a game looks like it might unseat them, but the Dungeon Siege games couldn't do it, Sacred couldn't do it, and now Titan Quest has failed as well. What's odd about this is that the Diablo games don't look like they're doing anything complicated. They look beatable. But possibly because Blizzard beta tests their games more than anybody else, the Diablo games have just the right balance of giving you things to do and giving you things to look forward to, that other games just haven't been able to match. Dungeon Siege gave you too little to do; Sacred inundated you with too many monsters to kill. And then there's Titan Quest, which either does things very well or very badly. There isn't any middle ground. Consider the graphics. 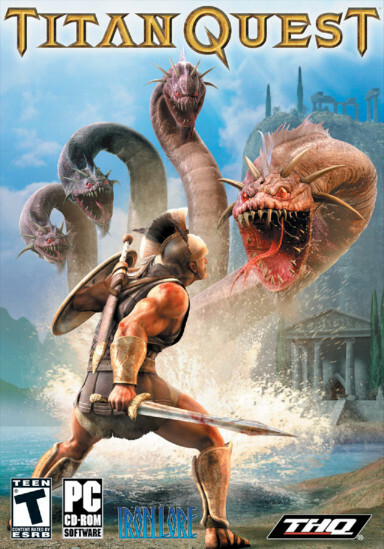 Titan Quest takes place in the lands of myth and legend. You start out in Greece (where you learn about the game's main conflict between the Greek gods and the titans), then you move on to Egypt, and finally you reach the Orient. Each of the main areas has a distinct look and feel, gives you different sets of creatures to attack, and allows you to explore fun areas, like Knossos labyrinth in Greece, the Tomb of Ramses in Egypt, and the Hanging Gardens in the Orient. Moreover, while I suspect that Titan Quest was generated with some sort of world editor, it doesn't suffer from the Neverwinter Nights disease, where all areas start to look alike. Developer Iron Lore Entertainment has a great eye for detail, and so, for example, when you visit the Parthenon in Athens and see a bunch of marble statues, it's not just the same statue plopped down several times. Each statue is unique. Or when you kill a creature, you don't just see one animation where it slumps to the ground and dies. Titan Quest uses some form of ragdoll physics, and enemies can end up flying through the air or rolling down hills, and no death looks the same. Or how about something that most developers wouldn't have bothered with? When you run through the underbrush, the grass parts and sways to match your movements, and it looks downright real. In other words, Titan Quest looks about as good as a game using an isomorphic view can look. The character development system also has a lot of potential. When you create your character, you only get to choose a gender and a color for your tunic (neither of which makes any difference in the game), but then when you start leveling up, you get to select and develop skill masteries. There are eight skill masteries in the game, such as the Warfare mastery, which involves melee skills, and the Storm mastery, which gives you cold and lightning spells, and you get to choose one mastery at level 2 and a second mastery at level 8. Each time you level up you receive points to put into the masteries. You can use the points to improve the skills in the masteries or to increase your rank in the masteries themselves (you might need to put points into the mastery to unlock skills in the mastery), and so you need to make a lot of decisions about how to spend your points. Do you put points into a lot of skills, or try to maximize only a couple? Do you spread your points between two masteries, or make one dominant? Do you put points into low level skills, or spend points on the masteries to unlock the high level ones? What's nice about the system is that Titan Quest doesn't allow you to maximize everything, so you actually have to make choices. Better yet, even after playing for a long time, the points you spend still help your character (unlike, say, in Dungeon Siege II, where the diminishing returns mean that high level points barely do anything useful). I played a Warfare and Defense character, and I never even got a look at skills like Battle Standard and Colossus Form, and so that gives me an incentive to continue playing the character, to keep unlocking new skills. The different combinations of skill masteries also give players a reason to try out new characters, just to see what works and what doesn't.